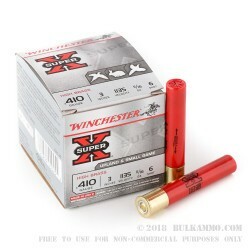 Winchester’s Super X line of ammo is synonymous with quality, affordability, and functional reliability. 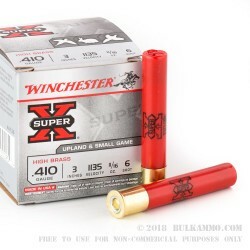 Their 3-inch .410 bore shells use 11/16 of an ounce of #6 shot size, loaded into new, reloadable, shotshells that are primed with non-corrosive primers. 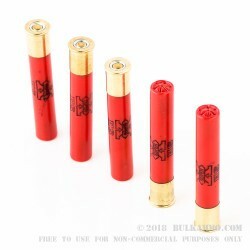 These high brass red hulled shells have a muzzle velocity of 1135-feet per second. Pick yourself up a couple boxes of these shells now so you can get in some range time with that little .410 bore pump-action shotgun. 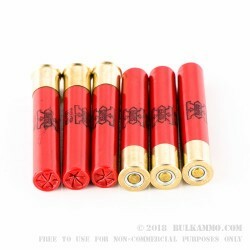 The .410 Shotgun shell is the smallest shotshell for “scatterguns” that is currently available on the open market. Some call it “the 410”, or .410 gauge, but it is technically not a .410 gauge. The Gauges are a unit of measure that is applied to the bore diameter of the shotgun barrel. It is measured by a lead ball that fits inside the barrel, and how much that lead ball weighs in fractions of a pound. For example: if a shotgun is a 20 gauge, that means that a lead ball that weighs one-20th of a pound fits down the barrel of a 20 gauge. The same applies to 12-gauge, 28-gauge, 10 gauge, and so on. But it does not apply to .410 bore. The “.410” is the barrels inner diameter, not the gauge measurement. These people know what their doing!